The Carlos Arvelo Municipality (named after Dr. Carlos Arvelo) is one of the 14 municipalities (municipios) that makes up the Venezuelan state of Carabobo and, according to the 2011 census by the National Institute of Statistics of Venezuela, the municipality has a population of 150,277. The town of Güigüe is the shire town of the Carlos Arvelo Municipality. 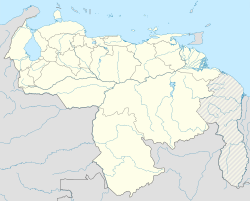 The Carlos Arvelo Municipality is located in the southeastern part of Carabobo State. It is limited to the north by the Lake of Valencia and the Municipality the Guayos, to the west the Municipality of Valencia, to the South the State of Guárico and to the east the State of Aragua. The Carlos Arvelo Municipality is integrated by the Güigüe Urban Parish (capital Güigüe) and the Belén Non-Urban Parish (capital Belen ) and the Tacarigua Non-Urban Parish (capital Tacarigua). The north of the municipality is mostly plain, unlike the central and southern part of the municipality, which is mountainous. Minimum monthly temperature in the Carlos Arvelo municipality lies between 12.3 and 22.1 °C, while maximum temperature is between 24.4 and 33.9 °C. Total annual precipitation fluctuates between 932 and 1395 mm. Most rain falls between June and August, while the driest quarter comprises January to March. The Carlos Arvelo Municipality, according to a 2011 population estimate by the National Institute of Statistics of Venezuela, has a population of 150,277 (up from 124,344 in 2001). This amounts to 6.7% of the state's population. The municipality's population density is 180 inhabitants per square kilometre (470/sq mi). ^ "Carabobo Carlos Arvelo" (PDF). ^ Ferrer-Paris, José R. (2017). "Caracterización ambiental de la ruta de NeoMapas: NM11 Güigüe, estado Carabobo (CNEB e12)". figshare. doi:10.6084/m9.figshare.4745545. ^ a b c "XIV CENSONACIONAL DEPOBLACIÓN Y VIVIENDA" (PDF). ^ "CONSEJO NACIONAL ELECTORAL - RESULTADOS ELECCIONES REGIONALES 2004". www.cne.gob.ve. ^ "Divulgación Elecciones Regionales - 23 de Noviembre de 2008". www.cne.gob.ve. ^ a b LIBERTADOR. "Divulgación Elecciones Municipales - 8 de Diciembre de 2013". www.cne.gob.ve. ^ "Divulgación Resultados Electorales Municipales y Regionales del Zulia 2017". This article related to a location in Carabobo, Venezuela is a stub. You can help Wikipedia by expanding it. This page was last edited on 30 October 2018, at 21:29 (UTC).